Hello Mary: Your Next Adventure is in 41 days! Andean Trails have a handy guide on Peru: Eat it, drink it, speak it, love it – I shall be practising my Buenos días and Buenas tardes, and looking out for plenty of aji (chili pepper) and ajo (garlic), and bright plastic ‘flowers’ tied to a pole above village doors. I’ve also invested in two more camera batteries. 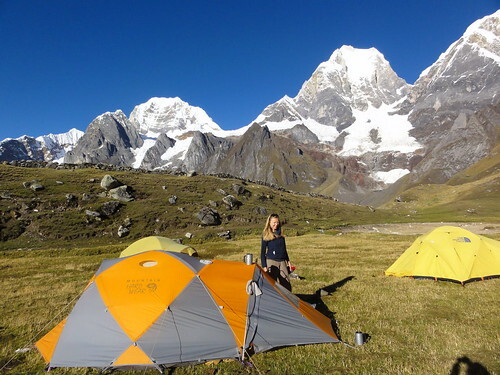 We’re camping for almost all of the 3 weeks we’re in the Cordillera Huayhuash, so opportunities for recharging will me nil. I’ve looked at getting a solar panel powered recharger, such as the powermonkey extreme, but they’re designed for mobile phones and tablets rather than camera / batteries which means there doesn’t seem a straight forward way to plug in with my camera or the battery recharging unit. So I’m taking six fully charged batteries. I hope that’ll be enough. According to the updated equipment list, I will also need some trekking poles (but not necessarily a walking ice axe, sadly) as “This trip involves the crossing of several potentially snow-covered passes and includes the option of ascending to the viewpoint, Cerro Jyamy. For this trip you must bring EITHER a ‘walking’ ice axe or a set of trekking poles. This is a safety measure only for the crossing of the passes and you will not necessarily be required to use this equipment.” I’ve never got to grips with poles/sticks – although I do remember Hazel and I agreeing, after the Thorong La descent, that there were times when they must come in very useful: mainly when walking in packed snow and slippery ice. So, I’m planning to get a cheap pair, probably these Trekrite Traveller Four-Section 58cm Walking/ Hiking Poles. That leaves a 4 season sleeping bag. For most of our previous trips, these have always been provided and have always been excellent – on the Three High Passes to Everest we had double layer Mountain Equipment down sleeping bags. Last year’s Mont Blanc Circuit was really the first time I’ve needed to DIY, and it was camping too. I took Phil’s Ajungilak 3 season bag and was a bit cold on a couple of nights when it was rainy or we were sleeping (almost) at the foot of a glacier. So, I’ve decided it’s time to invest in a 4/5 season bag of my own… making this weekend’s mission to work out which! Still, my new sleeping bag has arrived. After a visit to The North Face shop in Covent Garden, I plumped for The North Face Superlight, purchased from The Outdoor Shop, whose service has been excellent (I only placed my order on 16 June) as was their price (£199 plus free postage vs RRP £250). The Trekrite Traveller Four-Section 58cm walking poles arrived too – not nearly as exciting. 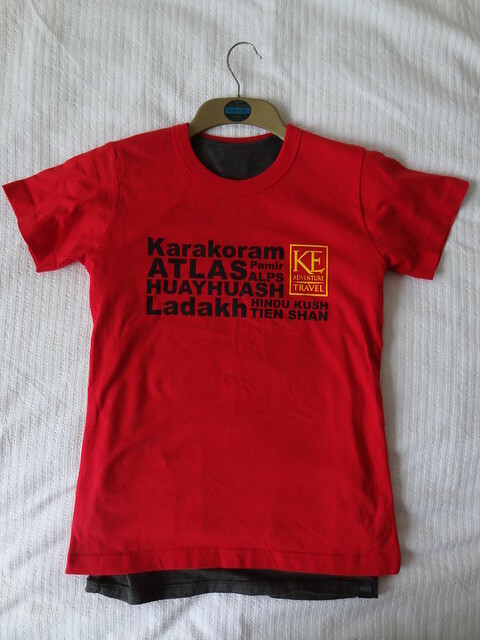 Our KE kit bags and T shirts have arrived, and I’ve treated myself to two new pairs of trekking trousers – so hopefully there won’t be any more photos of me with hems flapping around my ankles. 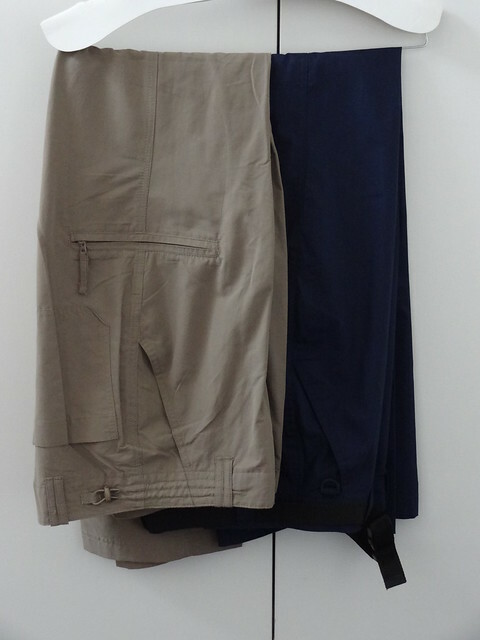 On the long length trouser front, I went for Gelert Women’s Hill Walking Trousers and Terrain Trekking Trousers, based on the GearWeAre review. I’ve also fixed up with Val to bring some solar lights and clinic kits, provided via her charity Light Education Development. 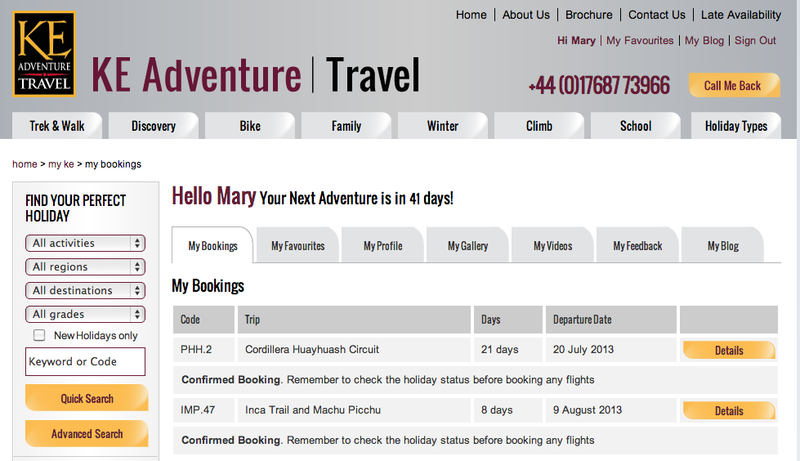 Cordillera Huayhuash Circuit plus Inca Trail to Machu Picchu: we’re booked! 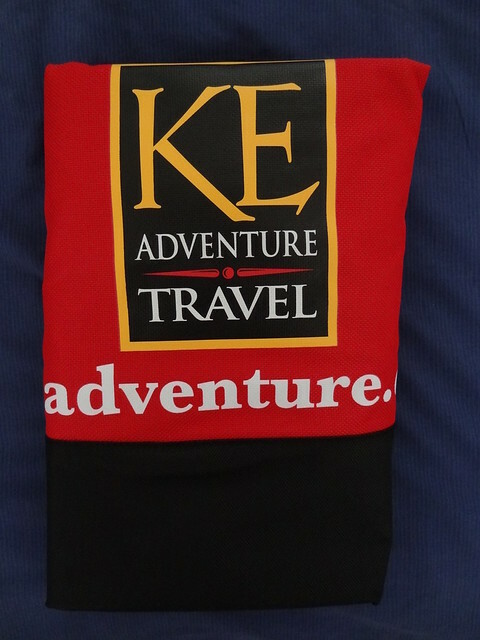 The summer’s big trek has finally come into focus – we’re off to Peru with (new to us) KE Adventure Travel. Despite a lengthy look at Ladakh none of the trips I found felt quite right, so I decided to revisit out the Huayhuash / Cordillera Blanca trek trips I’d picked out last summer – and lo and behold what do I find but Val, whose path we crossed at various points during the Three High Passes to Everest, is leading the KE Adventure Cordillera Huayhuash Circuit trip. 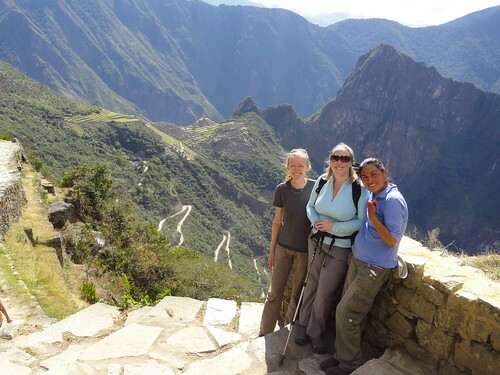 Plus KE Adventure do an Inca Trail to Machu Picchu trek that tacks on perfectly to make a 4 week trip. 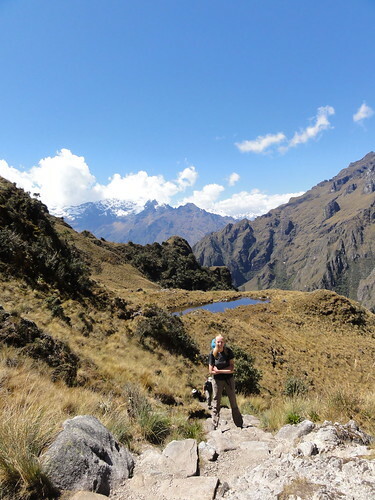 Well, you can’t go all the way to Peru to go trekking and not do the Inca Trail…. So: More mountains! More trekking! … This time combining camping, altitude, stunning scenery and use of a mountaineering ice-axe (according to the trip notes…). Getting there: Evening flight from London Heathrow to Madrid, then an overnight flight to Lima. PHH/2 Day 1: Arrive Lima, transfer to Faraona Grand Hotel. PHH/2 Day 2: A long day in our bus as we make the long drive across the Punta Conococha (4100m) to the town of Huaraz (3091m), where we check into the group hostal Hotel Colomba. 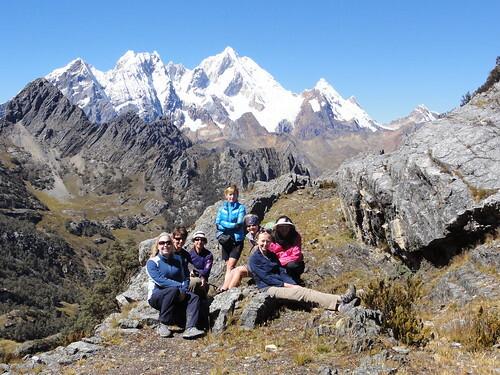 PHH/2 Day 3: We have a sightseeing and acclimatisation day in Huaraz, with the option of an easy 2-hour walk above the town. We will also visit the local craft market. 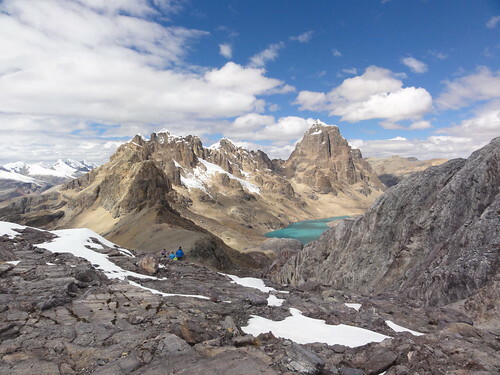 PHH/2 Day 4: Another acclimatisation day, with the option to make the 5-hour round trip towards a viewpoint near Laguna Churup (4500m), for views of Huascarán (the highest mountain in Peru (6,768 m / 22,205 ft) ) and other impressive peaks. PHH/2 Day 5: Driving through Chiquián to Quero, we meet our trek crew and start walking, as far as Marhuay where we camp in the grounds of the school. 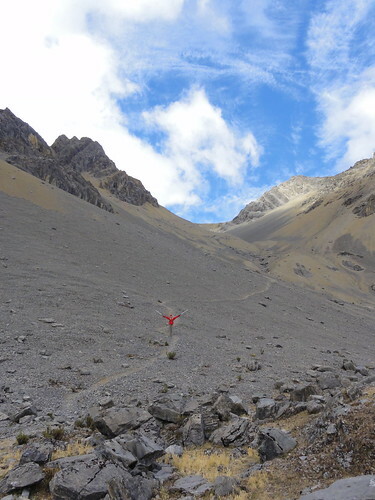 PHH/2 Day 6: Today, we ascend beside the Rio Radiash and enter the Quebrada Radiash where we make camp (4170m). After lunch there are a few ridges that we can investigate if we have the energy. PHH/2 Day 7: Diverting from the main Huayhuash trail, we cross two passes, Punta Milau (4660m) and Punta Sacsa (4750m). Descending from this pass, we camp at Quartlehuin (4200m). PHH/2 Day 8: Cross Cacanampunta (4700m) and descend into Quebrada Caliente before entering a tributary valley which leads to Laguna Mitacocha (4200m). We set up camp below the lake at Janca. PHH/2 Day 9: We climb to the next pass, the Carhuac (4650m) and have views of Siula Grande (6,344 m / 20,814 ft) from a nearby hill. 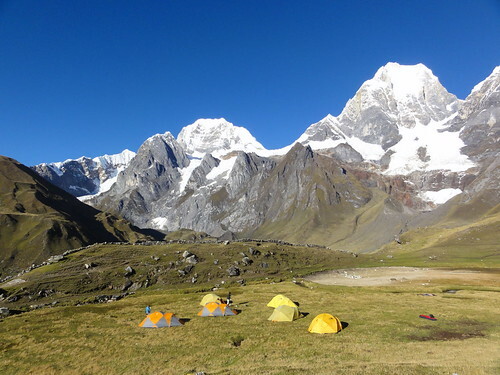 We then descend to a camp at 4200m above Laguna Carhuacocha and beneath the impressive peaks of Yerupajá (6,635 m / 21,768 ft) and Jirishanca (6,126 m / 20,098 ft). PHH/2 Day 10: A long day, with a choice of routes via Punta Suila (4800m) or Punta Carnicero (4600m) to reach the small hamlet of Huayhuash (4300m). PHH/2 Day 11: For the next 3 days, we use our local knowledge to deviate from the ‘normal route’ and seek out the very best of the ‘hidden’ Huayhuash. 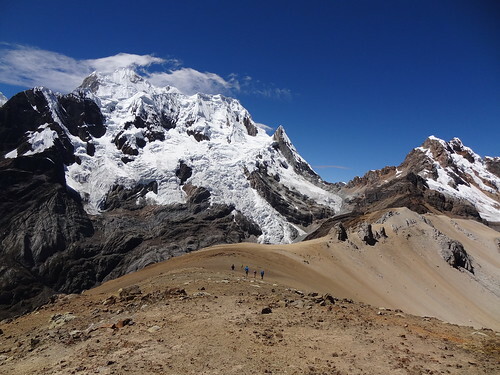 We climb to cross the Portachullo de Huayhuash (4750m) and then descend to a camp below Trapecio (4500m). PHH/2 Day 12: A steep ascent leads to Punta Trapecipo, at 5000m where we have superb views of the Huayhuash and Rata peaks.We have various options from this pass to ascend other viewpoints before descending to our camp and descend to our camp (4500m). 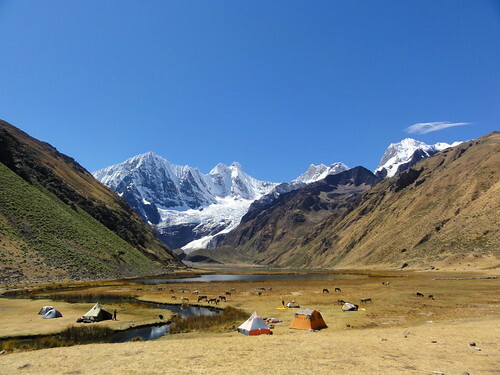 PHH/2 Day 13: We have the option of travelling down the Quanacpatay valley or crossing another pass to reach our next camp at Cototambo (4230m) where we have a fantastic view of Siula Grande. PHH/2 Day 15: We trek down the valley to the village of Huyapplla and the ascend to reach Whatia, below Punta Tarpush (4800m). Camp at Whatia. 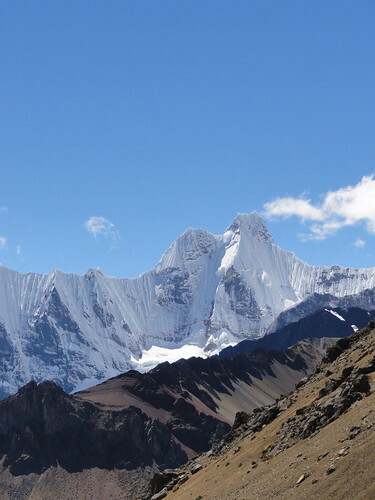 PHH/2 Day 16: Today, we cross the Punta Tarpush (4800m) and have the option to ascend Cerro Jyamy (5000m) from the pass. Descend to a lakeside camp (4500m). 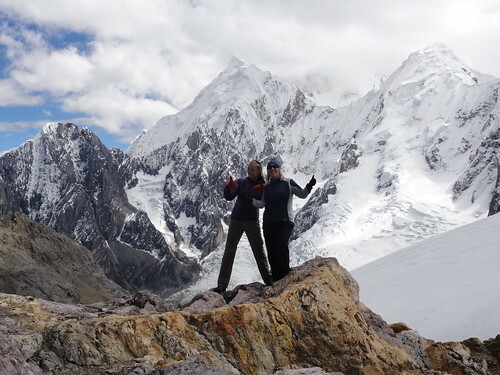 PHH/2 Day 17: After an initial descent, we trek up to the Punta Jahuacocha (4850m). A steep descent then leads to the lovely camp at Whacrish (4350m). PHH/2 Day 18: We have the option to cross another pass to reach Jahuacocha, or take the more direct route with the crew. The campsite at Laguna Jahuachocha is one of the most beautiful in the whole of South America! PHH/2 Day 19: Today we cross the final pass of the route, the Punta Llamac (4500m) and then descend to the village of Llamac (3250m). Here we say goodbye to our trek crew and meet our vehicles for the 5 hour drive back to Huaraz. Arriving in Huraz we check into our hotel and there will be time for a quick clean up before dinner and a soft bed! PHH/2 Day 20: After a leisurely breakfast we set off for the drive back to Lima where we check back in at the Faraona Grand Hotel and say au revoir to our Huayhuash trek mates. PHH/2 Day 21 / IMP/47 Day 1: Afternoon flight to Cusco and transfer to our centrally located hotel, Amaru Hostal. The rest of the day is free to relax and acclimatise. IMP/47 Day 2: We transfer to the Sacred Valley where we enjoy a full day of sightseeing visiting Inca sites with a local guide. We will visit the artisan market at Písac and the Inca ruins at Ollantaytambo. Overnight in the group hotel in Ollantaytambo. IMP/47 Day 3: After a short transfer to Piscacucho (Km. 82), we begin trekking the Inca Trail, today walking as far as Llactapata where we have our first night of camping. IMP/47 Day 4: Contouring above Wayllabamba / Huayllabamba, with great views of Huananay, we climb on the Inca Trail through beautiful cloud forest to our campsite at Llulluchapampa (3650m.). IMP/47 Day 5: Today we cross Warmiwañusca / Huarmiwanusca Pass (4200m) and Runkuraqay / Runccuracay Pass (3985m) trekking through luxuriant forest to reach our overnight camp at Phuyupatamarka / Phuyupatamarca (3650m). 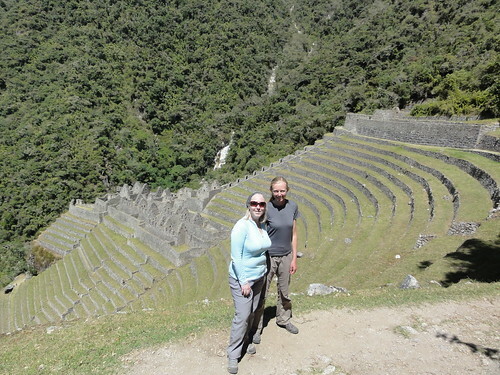 IMP/47 Day 6: Our final day on the Inca Trail leads us through the Inti Punku (Sun Gate) to Machu Picchu (2400m). From here we take a bus down to our hotel in Machu Picchu Pueblo (formerly Aguas Calientes) (2040m) where we check into our hotel. IMP/47 Day 7: A whole day to explore Machu Picchu. Following a guided tour of the citadel we have some free time to explore the monument, before we catch the train to Ollantaytambo and drive to our hotel in Cusco. IMP/47 Day 8: Afternoon flight from Cusco to Lima, then an overnight flight to Madrid arriving the following afternoon and on to LHR.